Berezanskite: Mineral information, data and localities. Named after Anatolyi Vladimirovich Berezanskii (b. 1948), who mapped the geology of remote areas of the Turkestan-Alai range, in Tajikistan. The Ti analogue of brannockite and sogdianite. Chemically somewhat similar to orlovite. The structure is based on the framework of [T(2)Li3T(1)Si12O30] group, containing, i.a., LiO4 tetrahedra. The A (Ti), B (◻), and C (K) sites are interstitial. The <C-O> distance is in inverse relation to the B site occupancy. Zapiski Vserossiyskogo Mineralogicheskogo Obshchestva: 126(4): 75-80. Hawthorne, F.C., Sokolova, E., Agakhanov, A.A., Karpenko, V.Yu. (2016): Refinement of the crystal structure of berezanskite, Ti2☐2KLi3(Si12O30). Mineralogical Magazine: 80 (in press). Canadian Mineralogist 42:107-119 (2004); Karpenko, V., & Pautov, L. (2002). 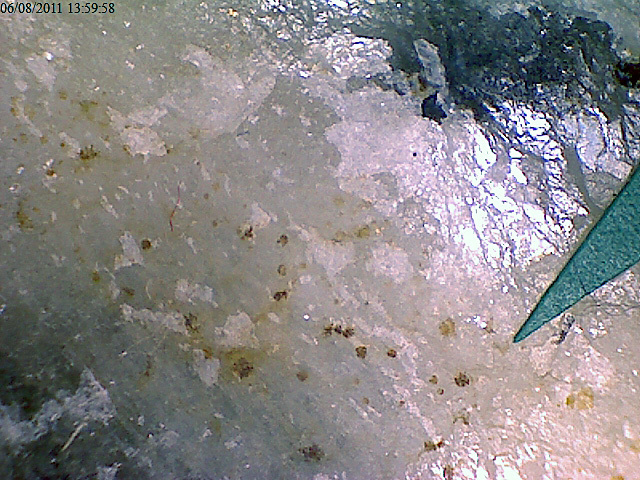 Formation of baotite in alcaline rocks of a moraine of Dara-i-Pioz glacier, Tadjikistan. Neues Jahrbuch für Mineralogie-Monatshefte, 2002(10), 459-467.